While wrenching on my $800 Jeep Grand Wagoneer this past weekend, I made a major gaffe that could have cost me hundreds of dollars. But it was just one of many blunders I’ve made over the years, and it’s the sort of thing I’ve come to embrace. And if you want to get into wrenching, then you should embrace your own idiocy, too. I’ve noticed that one thing keeping many of my friends from the wonderful kingdom of wrenchtopia is fear of screwing something up. While, if you’re smart about it, it’s pretty hard to do irreversible damage to your car, making mistakes will happen. And sometimes those mistakes will be totally bone-headed ones. Take the brilliant decision I made yesterday while working on my Jeep Grand Wagoneer’s Motorcraft 2150 carburetor. 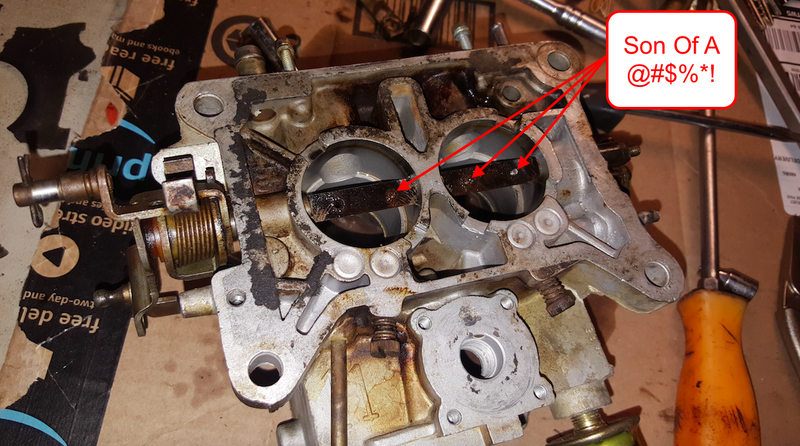 My friend Brandon and I were tearing the carb apart to prepare it for a beautiful carb cleaner-soaked evening, when we got to the throttle shaft. “Hmm, on my Willys carburetor, you can just unbolt the throttle plates, and the shaft slides right out,” Brandon told me. That seemed logical to me, so I began undoing the four machine screws holding the throttle plates to the shaft. I broke three of them. A quick google search later revealed that Ford’s Motorcraft division had “peened” those bolts on their back sides to prevent them from falling into the motor. In other words, I wasn’t really supposed to remove them. Admittedly, that google search should probably have occurred before I tried undoing the bolts. Breaking these particular bolts was especially problematic since the throttle plates have to sit precisely in the right location on the shaft to seal the throat properly. So drilling the broken screws out, and re-tapping would have been risky. Really, the only good way to salvage the shaft was to somehow get those broken machine screws out. And if that didn’t work, I’d have to pick up a new shaft, and try to figure out how to attach my linkage; or, worst case, I could have to pick up a new carburetor. (The good thing is that these Ford carbs are fairly common, though it’d be a bit harder to find one at a junkyard with the right linkages for my AMC 360). I got really lucky this time, because, after filing down the broken screws and sliding the shaft out, I somehow—even without a punch small enough to center my bit—was able to remove all three broken bolts by drilling into them and “walking” the fractured pieces out. On the plus side, the remaining 270 degrees seems sufficient for this application, especially once I use threadlock, and the other two bolt holes turned out pretty much perfect. This is just one of dozens of bone-headed mistakes I’ve made over my years of self-taught wrenching. You’ll recall that I recently caught my Jeep’s engine on fire (that was mostly my friend’s fault, but still), I locked up my 4.0-liter engine by putting the wrong bearing cap on, I broke pretty much every bolt on my Willys CJ-2A, I forgot to attach the serpentine belt properly on my Jeep Cherokee (it shredded on the highway), and I forgot to hook up my alternator after replacing it (the battery subsequently ran out on the highway). One of my favorite blunders wasn’t my own, but my friend Clay’s. One day, as he was bolting the differential cover back onto his Ford F-150 after draining the fluid, he managed to break a bolt. Yes, he broke a bolt while tightening it! My friend Clay learned from that day on never to use a breaker bar to tighten a bolt, because it doesn’t take much force to break something when you’re yanking on a two-foot pipe. And that’s my whole point; stupid mistakes are inevitable. Embrace them, and learn from them. My friend Clay learned how to tap new threads into a differential housing, I learned how to drill out tiny bolts with a left-hand drill bit, and who knows what else I stand to learn as a result of my own stupidity. But hopefully I won’t have to deal with any such drama anytime soon, because all I want is for this carburetor to breathe new life into Project Redwood’s AMC 360 V8. That way, I can drive the beast into my garage before Michigan turns into a wintry hellscape on Wednesday.